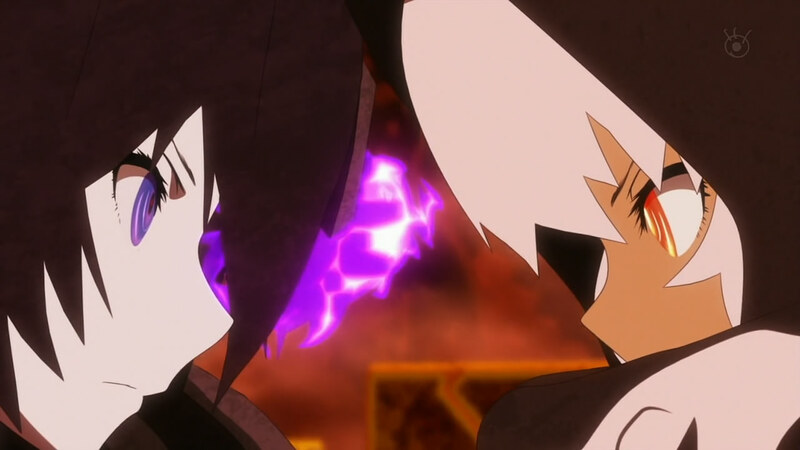 In order to save Mato from Yuu, Strength decides to sacrifice herself to force Yuu to disappear. 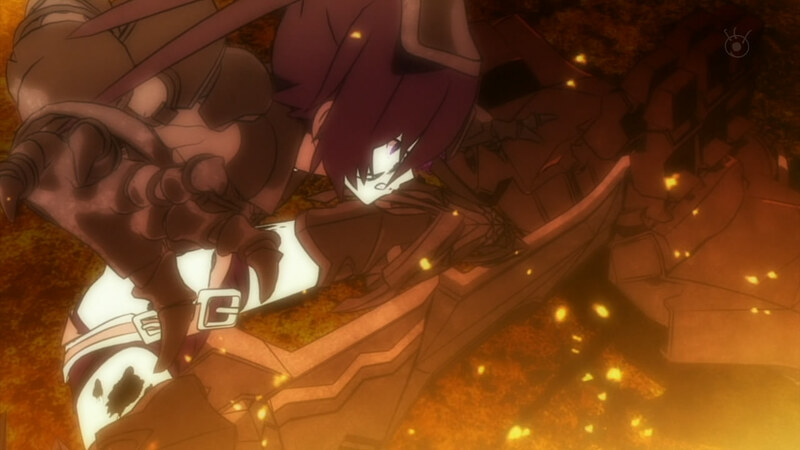 Mato uses her willpower to not only stop Black Rock Shooter from killing Yuu, but save Strength. This leads to Mato facing off against Black Rock Shooter. 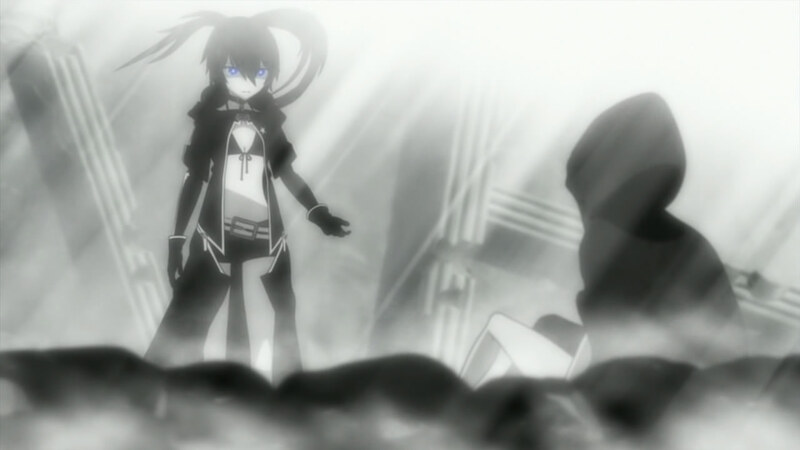 Mato is losing, but the other girls appear to help her, allowing her to beat Black Rock Shooter. After the battle, Strength is able to reassure Yuu before finally dying. Things basically go back to normal from there. Mato, Yomi, and Kagari return to being friends, and Yuu readjusts to the real world. The series ends with Strength reactivating in the other world as well. So admittedly this ending wasn’t so bad. Still, I’d like to poke some holes at it. 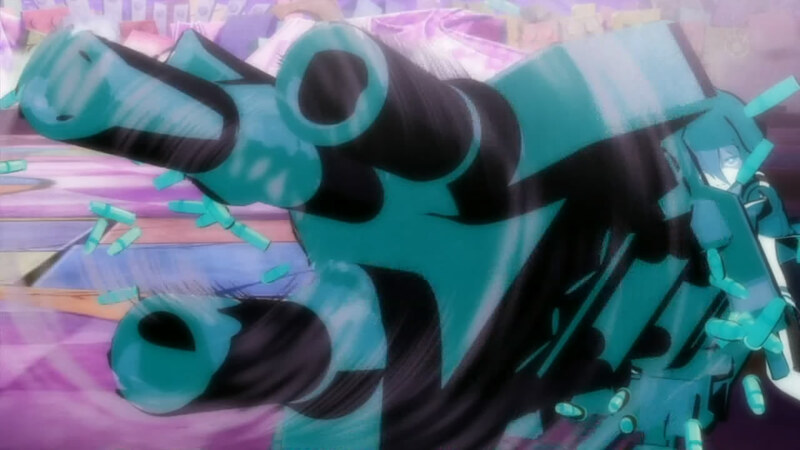 The whole bit with the girls coming to help Mato and like combining colors into a final attack. While it was predictable and probably a little bit fitting for the end, it was extremely cheesy. 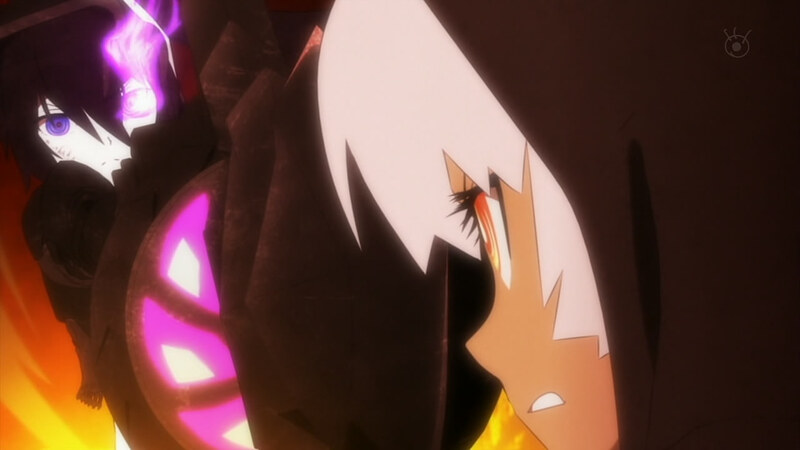 Mato facing off against Black Rock Shooter in the end…I was cool with that. That ended up going alright. The problem I have with the ending is that they all decided to take their pain on themselves, but all of their other selves have be reanimated. What does that mean for the other world? Do they only siphon the major pain? Will they continue to fight? Do they just exist and do whatever they want? With that done, I’d really like to talk about the series as a whole, but I’ll keep it minimal to save it for when I actually review it. For the most part, I thought it was a pretty good show…just confusing at points. Not sure what happens in the game, so I don’t know how this relates to pre-existing Black Rock Shooter content. Still, I haven’t minded posting about it and I hope you’ve enjoyed this as well. Series review will come later. After the events of last week, Saya can no longer interface with Black Gold Saw. Yuu decides to go into the other world herself to talk with Mato. 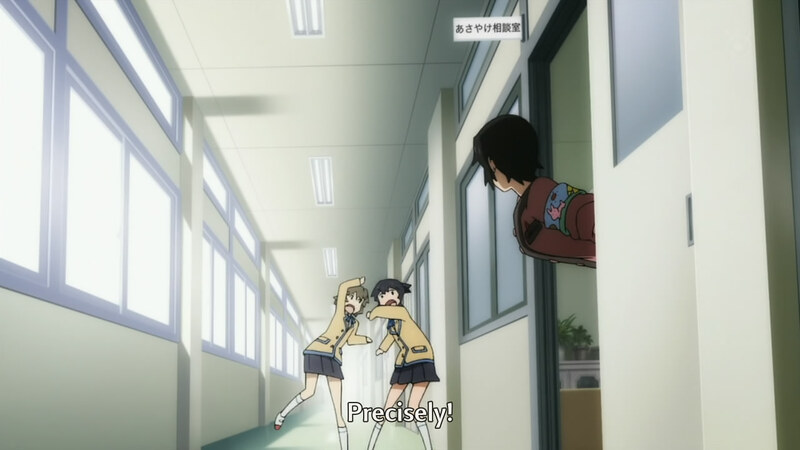 Yuu tries to get Mato to free herself by rejecting Black Rock Shooter as herself. Before Yuu can convince Mato, Strength starts to talk, revealing that she is the true Yuu and Strength is the one in the real world. Meanwhile, Mato is revealed to be missing at school, and Yomi finds herself running to find her. Strength tells Mato the story of her and Yuu, how Yuu’s pain was so much that she gave Strength the ability to feel emotion. Yuu started to believe that the other world was an easier life, so she switched with Strength. Meanwhile, Yomi completely remembers Mato and Dead Master starts to come back to life in the other world. Interesting. It’s almost looking like Yomi might be the one that has to help Mato or something. Like overcoming the memory loss to save her…something to that effect. Who knows? Maybe Kagari will even join in. I’d say stuff is starting to make more sense and the show seems to be getting better. I was afraid Mato might yell out “You’re not me” and Black Rock Shooter would change into a Shadow or something, but that doesn’t seem to be the case. I was definitely curious what they would do about the other girls when their memories went away. It would have been stupid to just resolve their arc and let them be normal girls that didn’t affect the rest of the story. Good to see they brought them back. Especially with how important Yomi was in the OVA…would have been weird for her to just be “another girl with problems.” Anyways, next week is the big finish, so let’s hope it goes out with a bang. 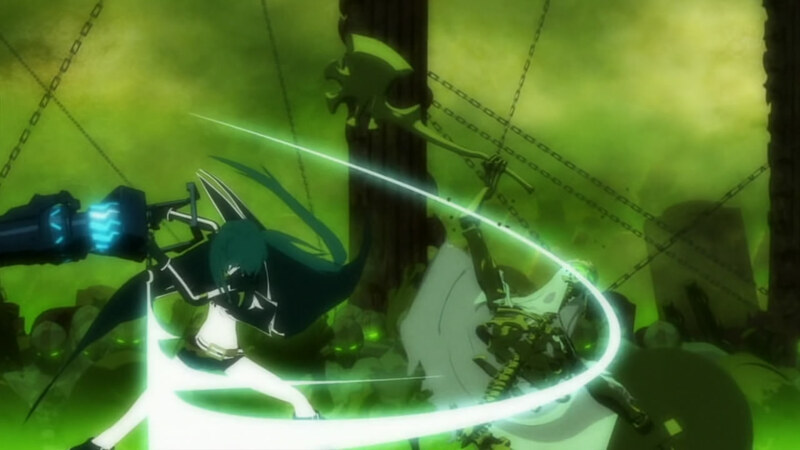 In the aftermath of last week’s episode, Black Rock Shooter gains a different appearance and faces off against Black Gold Saw. In the real world, Mato remains unconscious, so Yuu takes her to Saya. Saya tries to talk with Mato in the other world, telling her about her own past. Apparently, Saya befriended the original Yuu, who tells her about the other world. Saya doubts Yuu when her house is burned down, and then Yuu starts to avoid her. When she finds Yuu again, Yuu tells her about Black Gold Saw. Back in the alternate world, Black Gold Saw is saved from Black Rock Shooter by who I assume is Yuu’s other self, who seems to have forgiven Saya. Now that’s an interesting twist. Saya is actually working to help everyone, it seems. I feel like I should have seen it coming, but for some reason, I didn’t. I’m not completely sure what to expect next. It seems like Mato will try to fight against the idea of the other world, but that forces the grief of the real world on the girls who would normally have alternate forms. I feel like that could be taken as a good or evil act, depending on how you look at it. I’m curious to see how they approach it. Alternatively, the series could just end with Black Rock Shooter returning to normal. That seems even less likely, though, because I would think that Black Rock Shooter will go back to normal next week judging by the pacing. Maybe it’s the nature of the other world or the translation, but I just feel like I’m not grasping everything. Maybe it just means I need to play the game. Hopefully, things will all make sense in the end. The battle between Black Rock Shooter and Dead Master rages on. In the real world, Mato and Yuu pick up Yomi, who seems cheerful despite her panicked mother. Yuu confronts Saya (the counselor), suspicious of what she has done to Yomi, but gets no answers. Strangely, Mato goes to basketball practice to find that everyone has forgotten Yuu. 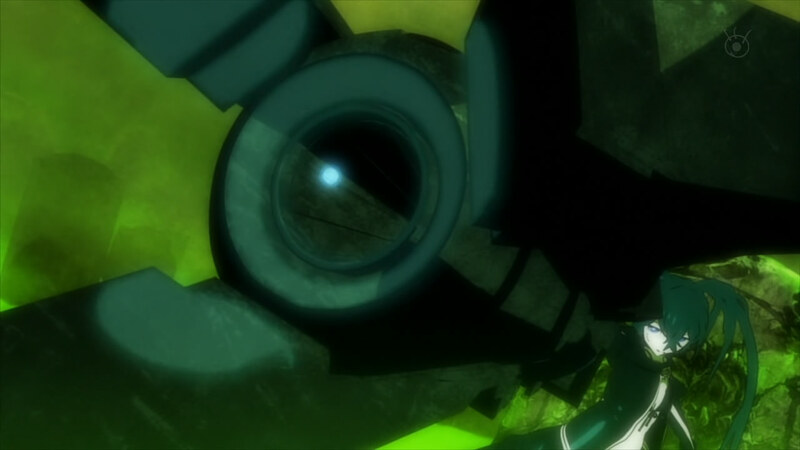 Yuu ends up appearing before Mato, though, telling her about the alternate world and her connection to Black Rock Shooter. She reveals that Black Rock Shooter is a personification of her grief, and that her death would lead to Mato becoming free of her grief (this is basically what happened to Kohata and Kagari). Mato rejects this battle and instead decides to try and resolve everything by talking with Yomi. 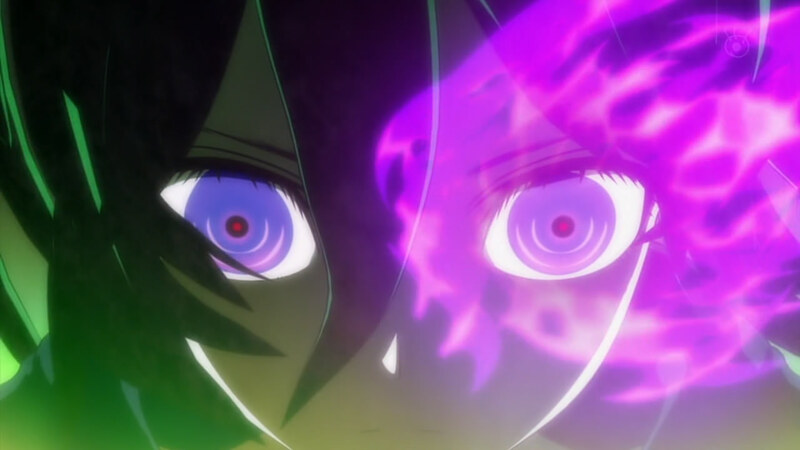 Yuu then sends Mato to the alternate world with Yomi, but Black Rock Shooter has already stabbed Yomi. 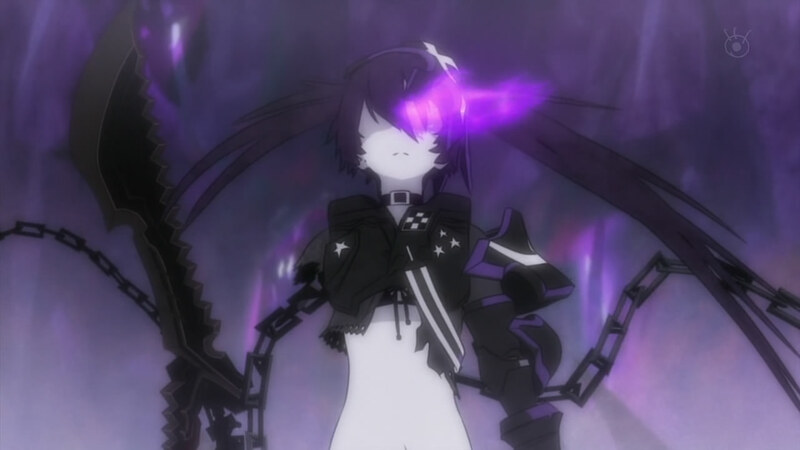 The episode ends with Black Rock Shooter taking a more emotionless appearance. Ok…that was cool. I think that’s what missing last week…the other world. The presence of the other world is just so much more prominent in this week’s episode. Also, things are getting serious. I guess Yomi has been cured, but it seems that Mato has been broken as a result. Also, when will she come back from the alternate world? I have to wonder. Is Yuu actually trying to help Mato? 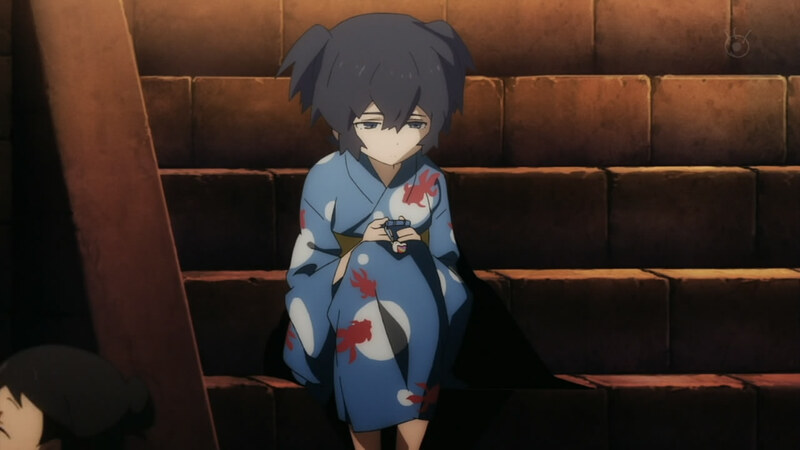 She says something to the effect of “this was the only way.” While it could be interpreted that she is doing this to help Mato, but at the cost of some suffering, it’s also possible that she has been forced to do this to Mato in order to save someone else (like a relative or something). But still…even though they tried to explain everything, I still have no idea where everything is going. And at episode 5/8, I find it weird not to have a definite plot direction. I guess we’ll have to see next week. This week’s episode starts off with Kagari joining Mato’s class. She is instantly popular, which actually isolates Yomi even more. Also, after the big freakout from last week, Kohata seems fine. Yomi starts to take her anger out on Kagari, mostly because she no longer needs Yomi. Meanwhile, it seems that Kohata has completely forgotten the boy she confessed to. Yuu tries to talk with Yomi and befriend her, but Yomi can’t get past her jealousy. Yomi tries to cling to Kagari, but she has forgotten most of the stuff from before and wants to distance herself from Yomi. 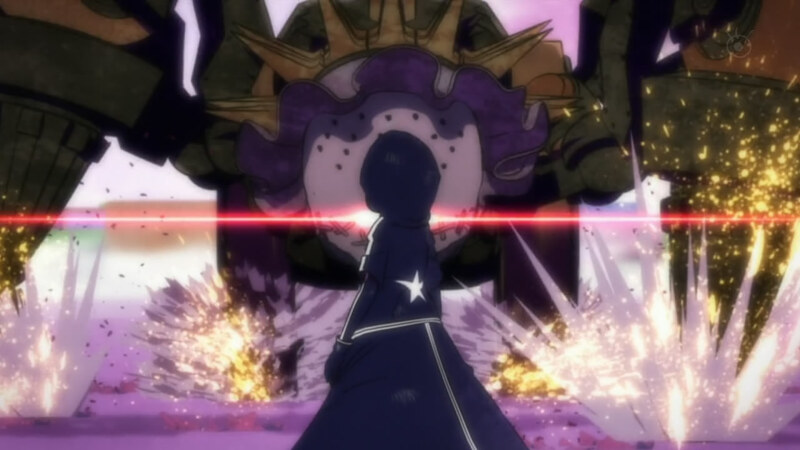 In the alternate world, Yomi goes berserk and prepares to fight against Black Rock Shooter as the episode ends. Well, that was certainly eventful. I’m still wondering about the whole “cutting of the head” deal with Kagari and Kohata. On the surface, they look like they’re fine, but it just doesn’t feel complete with how Black Rock Shooter handles it. It feels like there should be unresolved conflict with them. I hope the amnesia bit isn’t just a cheap way to wrap up their stories quickly, because that would be boring. It was pretty clear that Yomi was going down the road to crazy last week and this episode, she finally snaps. I’m guessing they’ll resolve everything for her next week because of how little time the show actually has. Can you believe we’re halfway through already? Anyway, I’m not sure what else to say about this episode. Isn’t there another character in the alternate world they need to introduce? Maybe I’m mistaken…time’s running low, though. After the events of last week’s episode, Kagari seems to be acting more normal, and Mato and Yomi are becoming good friends. At school, Mato witnesses her basketball team captain, Arata Kohata, giving a love letter to a boy. Mato goes to a training camp with the basketball team, but Yomi starts to get jealous of Mato’s friend Yuu. Kohata’s love letter is posted on the bulletin board at school, which causes everyone to start ridiculing her. 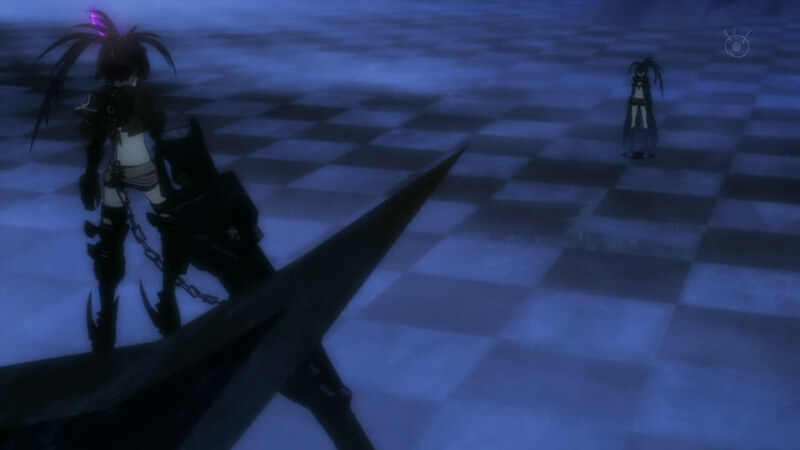 In the alternate world, Black Rock Shooter confronts the enemy from last week (I guess it’s Black Gold Saw). She finds who I can only assume is the alternate world form of Kohata, then ends up cutting off her head. Kohata then collapses in the real world. As I figured, there was something off with the ending of last week’s episode. Yomi still seems to have some unresolved issues, likely symbolized by her getting sealed away last week in the chasm. And I guess the counselor is evil? She seems to be linked to mystery enemy woman from the alternate world. So when I watched the movie for Black Rock Shooter, it seemed like the alternate world and the real world were more separated, with Yomi disappearing into the alternate world and Mato going after her. This rendition seems to put the two worlds side-by-side in a sort of parallel universe style. Honestly, I kinda liked the movie’s approach better. Anyways, it looks like another battle next week? The alternate world took the back seat this week, so there really wasn’t much action. I look forward to watching a good battle next week. Picking up from last week, Black Rock Shooter continues the fight in the alternate world while Mato tries to go to the summer festival with Yomi. However, Yomi never shows up, forced to stay home with Kagari. 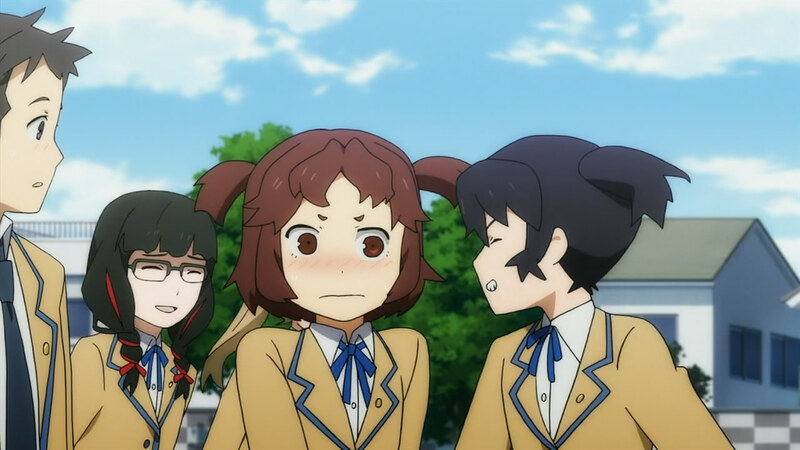 At school, Mato ends up getting angry with Yomi, but later regrets it after talking with the counselor. She goes to Yomi’s house to apologize, but Yomi is again stopped by Kagari, falling down the stairs to stop her. At the hospital, Yomi’s mother reveals that Kagari’s paralysis is mentally-induced. Mato tries to force herself into Kagari’s room, which causes Kagari to freak out. Desperate, Yomi calls out to Mato for advice, and finally stands up to Kagari. In the alternate world, Yomi and Mato try to force Kagari out, but they are stopped by a fourth person (in red). She then seals Yomi away and then Mato “kills” Kagari. Back in the real world, Mato finally enters the hospital room and Kagari smiles as the episode ends. Not really sure what to make of this. Did this scene mean that Kagari is back to being a normal girl now? Or is it something more sinister? The alternate world definitely didn’t make it look like a good ending. The battle was alright in this episode. While it didn’t look bad, there was nothing that really stood out. The robot was shooting out macaroons for crying out loud. We’re already a quarter of the way through the show. At least two more characters need to be introduced and I think there’s more to this story, so we’ll wait and find out. So after much delay, the first episode of anticipated series Black Rock Shooter arrives. We’re introduced to the energetic main character Kuroi Mato, who meets the quiet girl, Takanashi Yomi on her first day at school. The two girls bond over their shared love of a story about a bird that takes people to a world of many colors. While they are at Yomi’s house, a strange girl in a wheelchair named Kagari arrives, which freaks Yomi out. Kagari clearly has a problem with Mato, constantly telling her to go home and treating her poorly. The next day, Yomi tells her that the two of them can’t be friends, but Mato continues to insist. 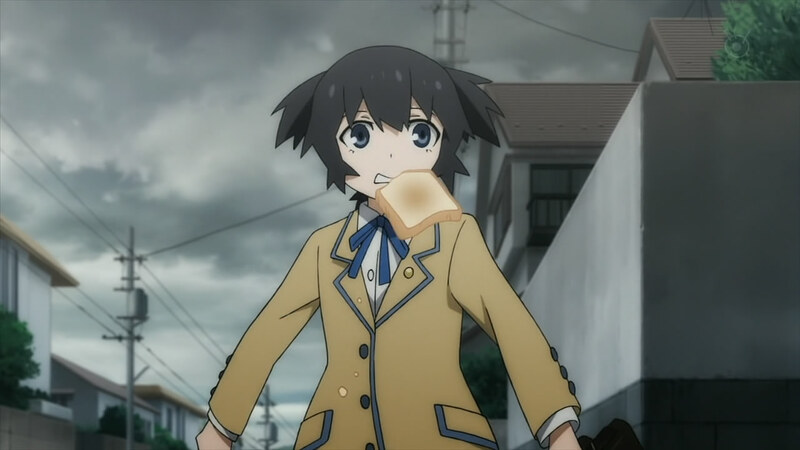 Similarly to the movie, the first episode flashes between the battle of Black Rock Shooter in the other world and Mato’s school life in the real world. I thought it looked pretty good for the first episode. 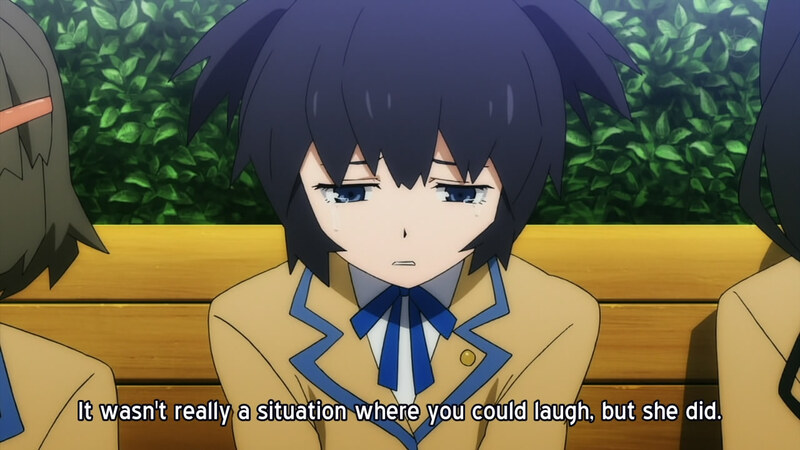 I don’t actually know too much about the whole Black Rock Shooter franchise or anything (I really should find a way to play the game), but I didn’t really have many complaints. Eight episodes isn’t really much…I wonder how they’re gonna manage it. The ending theme sounded alright, but I have trouble listening to vocaloid music, so it made it hard for me to hear the song itself. Piano music in the background was a nice touch, though. I’d say this episode was okay for a start, but as usual, I don’t have enough to make a judgment on the show yet. So, we’ll just have to wait and see.